The UK public's faith in the lobbying industry, MPs, Lords and private firms has dropped significantly following the recent media stings, PRWeek/OnePoll's latest research has found. The recent investigations by The Daily Telegraph, Panorama and The Sunday Times into supposed lobbying corruption, resulting in Newark MP Patrick Mercer quitting his post and Lord Laird resigning as the Ulster Unionist whip, have again placed the industry under public scrutiny. Unease over lobbying has increased by nine percentage points, with 59 per cent of respondents saying they see it as an issue of growing concern. Interestingly, worries over specialist public affairs agencies' involvement with lobbying has dropped from 11 per cent to eight per cent. 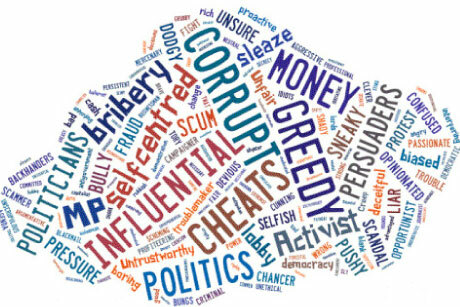 But disquiet over former politicians' involvement has shot up from ten per cent last year to 14 per cent this year. Meanwhile 38 per cent claimed lobbying did more harm than good to British democracy. The recent stings have caused the public's view of MPs, Lords, lobbyists and private firms to plummet. 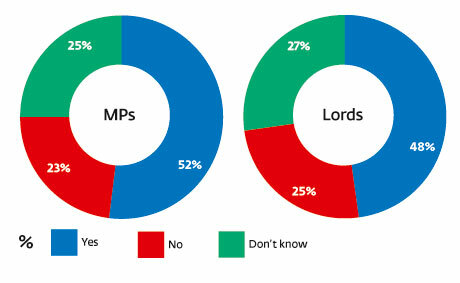 Fifty-two per cent of respondents said their opinion of MPs had been lowered, with 48 per cent feeling the same about Lords, while 42 per cent agreed they felt worse about lobbyists and 38 per cent claimed a lower opinion of private companies. The other group affiliated with lobbying in the survey was journalists, of which 33 per cent of respondents said they had a lower opinion following the recent stings. 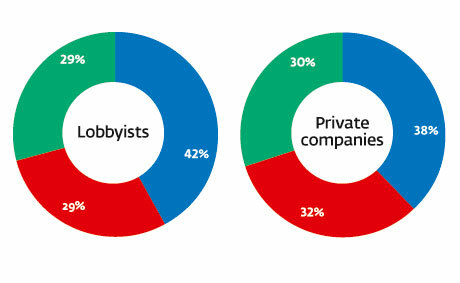 Unfortunately, it appears that most people genuinely do not understand who lobbyists are or what they do. Two things struck me about this survey. 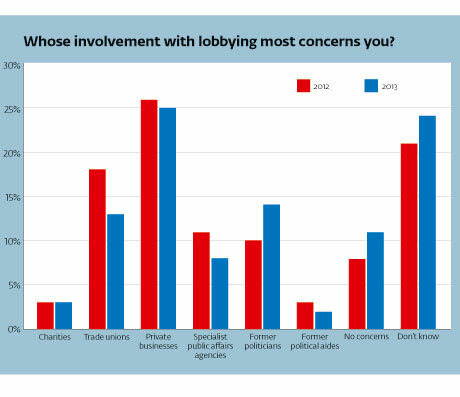 Firstly, there was more concern about private business lobbying government than third-party lobbyists. Secondly, journalists have emerged from their respective sting operations relatively unscathed in comparison with those who were stung. Why, then, is the Government hooked on a statutory register simply for third party lobbyists? Given that most of this group are already on a register and adhere to a strict code of conduct, why would the Government even think about legislating for a register that does not include all those who lobby? A narrow tick-box lobbying bill, which excludes big business and its in-house teams, will smack of big business lobbying government to get itself off the hook. Meanwhile, the media stings will continue to focus on the many that do not appear on a statutory or any other register.